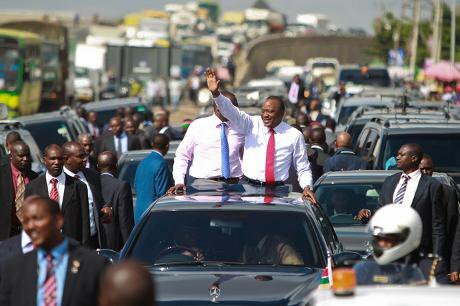 Riding high: Uhuru Kenyatta returns to Kenya from the ICC. Daniel Irungu / EPA.Uhuru Kenyatta of Kenya has become the first-ever sitting president to appear before the International Criminal Court (ICC). He faces charges of direct involvement in the violence that followed the elections of 2007-08, when more than 1,000 people were killed and more than 500,000 were displaced. One would probably expect that a presidential candidate indicted on charges this serious should expect a fatal decrease in popular support. 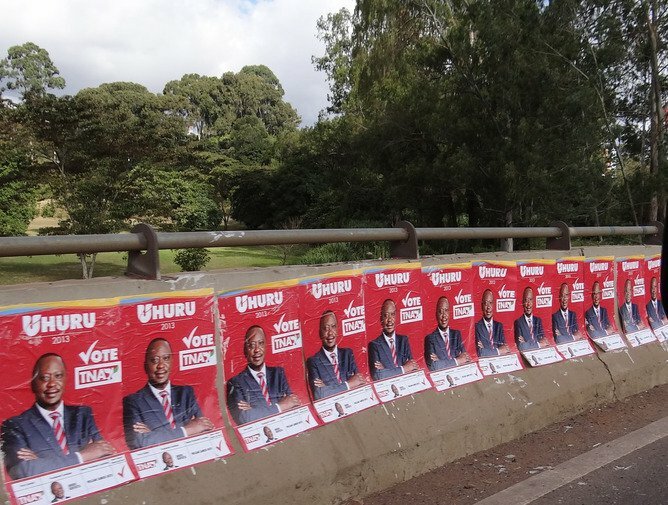 Yet when Kenyatta was elected president of Kenya in March 2013, many read it as a sign that the ICC’s intervention may have actually helped him win, or at least consolidate his position. Undoubtedly, Kenyatta deftly deployed populist rhetoric to discredit the court’s operations and win over the Kenyan electorate. The two main arguments he and his supporters used were familiar: that the ICC is racist and that it is over-politicised. The court undeniably has an African problem: all the investigations opened within the courts of the ICC in The Hague concern African countries. Kenyatta was able to exploit this awkward fact by recalling Kenya’s colonial past, which is still a vivid memory for many Kenyans. Claiming that the Western powers that ruled the country during colonialism were using the ICC to establish new forms of imperialism in the country, he was able to spin the charges into a powerful populist narrative. Yes we Kenya. Global Panorama & Heinrich Böll Stiftung / Flickr. Some rights reserved. For its part, the African Union (AU) has openly fought against the ICC, asking its members not to comply with the ICC’s requests for the arrest of the Sudanese leader, Omar al-Bashir, and trying to defer the Kenyatta case. It has not escaped criticism for this; many have decried the AU’s attitude towards the court as hypocritical and have accused it of promoting impunity. The ICC’s relations with the African continent are complicated in other ways. Many African states (such as Ethiopia) have never ratified the Rome statute, the founding treaty of the ICC drafted in 1998. Dozens however have, granting the court the legitimacy needed to open investigations, while many Asian and Arab states have been more reluctant to do so. China and Russia have a veto over the Security Council’s actions and they are unlikely to allow cases against their allies in North Korea or Syria—meaning many obvious non-African candidates for legal proceedings are effectively insulated. Kenyatta started his attacks on the court by highlighting the fact that the investigation bypassed the former president Mwai Kibaki and his 2007 opposition challenger Raila Odinga. Many have questioned whether the ICC is just a political tool used to install and support pro-Western governments, especially after the indictments of Muammar Qaddafi and Omar al-Bashir. The power of the indicted has to be marginalised, at least until they are cleared of all charges. That standard is not an exceptional one: the court removes potential authors of heinous crimes from power just as the Congress of the United States removes those it impeaches from the US government. The ICC’s actual capabilities are greatly misunderstood and the court’s actions are not a result of racist or politicised strategies; they are a consequence of the its limited potential to play an active role in the international community. Indeed, that Kenyatta was able to exploit these two arguments against the ICC illustrates the court’s real problem—the lack of an effective communication strategy. The court is perceived as distant, alien and even inimical to local life, and statements and clarifications from the courtrooms in The Hague just don’t reach the populations of the countries in which the ICC is operating. In the Kenyan situation, this has allowed an accused leader to construct an anti-ICC, and in turn anti-Western, narrative which has galvanised nationalistic groups to get behind him.